Mother’s Day is considered to be one of the most important days of the year and for good reason. Our moms are incredibly important to us and help us shape who we are. It only makes sense for us to give back and let her know how much we care. With Mother’s Day just a hop, skip, and a jump away it’s about time to start thinking about what you can do for your mom to truly light up her day. Here are a few Mother’s Day gift ideas to give your own mom this year. Bouquets make a great gift for any time of the year and for any holiday, but especially for Mother’s Day. Flowers are a long-held traditional symbol of endearment and love. What’s more, they smell amazing and make for a beautiful centerpiece. Flowers are a common but heartfelt gift for all moms. 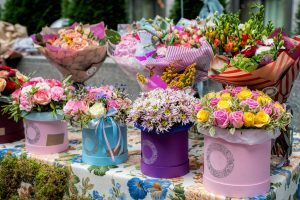 In fact, Mother’s Day accounts for as much as one-fourth of all holiday floral purchases in the United States. But what are some of the best flowers for Mothers Day? Popular flowers on this celebratory day include roses, tulips, lilies, azaleas, orchids, and daffodils. Consider talking to your local florists about creating a mix of some of the best flowers for Mothers Day into a single bouquet. The common expression “time is money” may mean you shouldn’t waste your time, but it also means that your time is just as valuable as money. That being said, another great gift you can give your mom this Mother’s Day is your time. A bouquet for your mom is great, but not if you simply gift them and leave. Consider making some time for your mom this year and sitting down for a chat. Catch up with each other over a cup of coffee or even go shopping together. You’d be amazed by how much your mom will appreciate just seeing your happy face. Even with a childless house your parents still have a lot to take care of. Consider giving your mom the gift of relaxation this Mother’s Day. Grab the mail for her, make her breakfast, and clean a little around the house. You know that drop in your mood you get when you remember you still have to do the dishes? Your parents get that feeling too, especially when they’re single. So give your mom a helping hand and let her relax the day away. Flowers can make an amazing gift for any occasion. For more information on the best flowers for Mothers Day, birthday flowers, and holiday flowers contact Open Blooms today.